We thought to share few shots of the work in progress! It's more likely a personal memory rather than something interesting but... somewhere we should start, shouldn't we? Roofs are done. We used a unique kind of tiles, painted with a hand made colour mixed with natural soil. It looks good, doesnt it? The making of the roofs. On the left side bungalow you can see the main structure in bengkirai wood while on the right side one you can see the local made Bedeng bamboo that we used for ceilings. This is the main structure of the restaurant/cafe. The big poles are going to support the roof. Made using a really strong local wood called "Iron wood" or Ulin, all these poles from recycled wood. We are testing the pool to see if it's not leaking. We spend a great amount of time to design this pool so to be kids friendly, as well as long/deep enough for a great morning swim. We can't wait to try it, do you? This is the construction site. 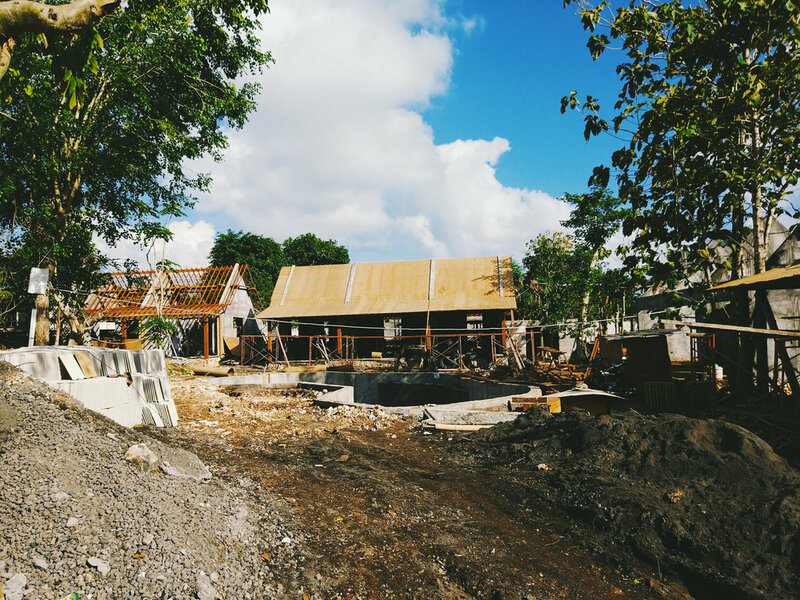 On the left side you can see also the building of our dear friends from Casa Asia, one of the greatest Italian restaurants in Bali. It just around the corner, how does it sound?